I might see you at Federation Square, if you are Melbourne based. Please say hi, if you are in the area. I’d love to see you. I’m bringing a small number of limited edition prints to sell at the book stall along with signed books. Below are some prints from the actual book, that will be for sale. And following them you’ll see some altered book prints which show the inspiration for the medium that was used in the book. But they also show the difference between the artificially created cream and the natural vintage book parchment. The parchment is naturally a much dirtier colour… which appeals to my inky nature, but the Allen & Unwin book designer Sandra Nobes very rightly recommended a clean cream for the book itself, and this is where PhotoShop was my ally. Thanks Sandra and PhotoShop. 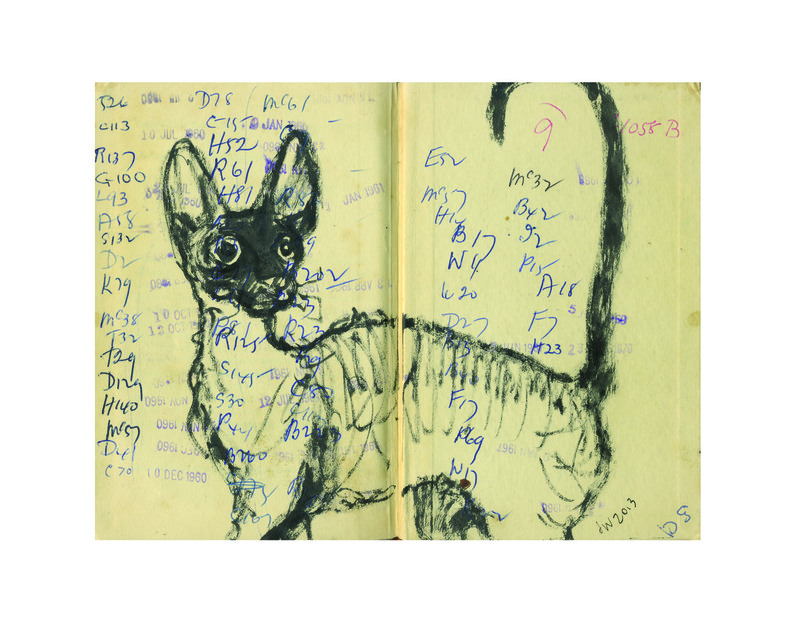 This entry was posted in altered books, birds, books and reading, cats, dogs, Events, For Sale and tagged #FederationSquare, #thunderstormdancing, altered book, altered book art, animals, Ann Haddon, Ann James, Australian illustrator, beach, book illustration, books, cat, cats, Cornish Rex, WhatsoninMelbourne on June 12, 2015 by Judy Watson. Here’s a lesser known part of the job of being a drawing machine. 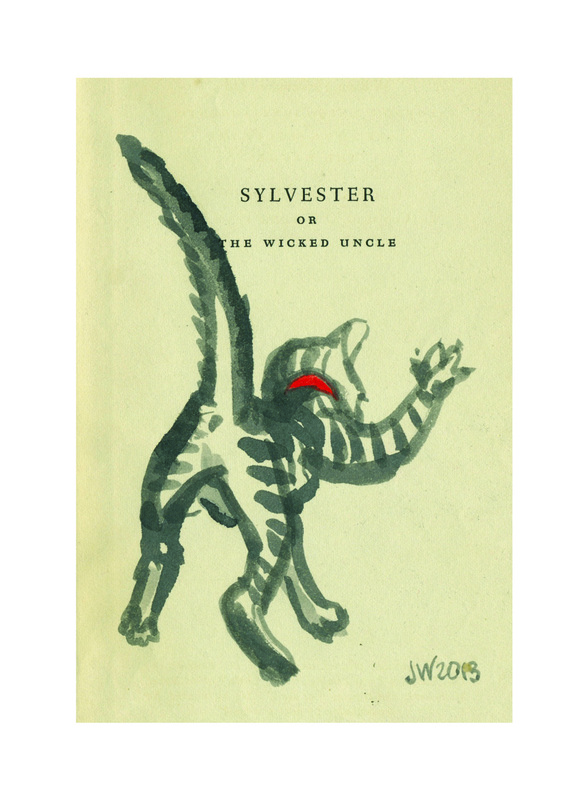 When we sign books for people, it is a nice thing for them if the signature comes with a little doodle, drawn for them, right before their very own eyes. And it’s nice to be able to do that for them. It makes us happy too. If it works. But the inscription is done in pen and can’t be rubbed out or corrected. And when we draw during the usual course of our day, we usually do many drafts of any illustration before we get it right. And if we mess up our inscription doodle we have the problem of either sending a deplorable doodle out into the world defacing the otherwise pristine title page of a newly purchased book, or replacing the book with a new one… which we might also mess up. That is why I am practising my book signatures today. 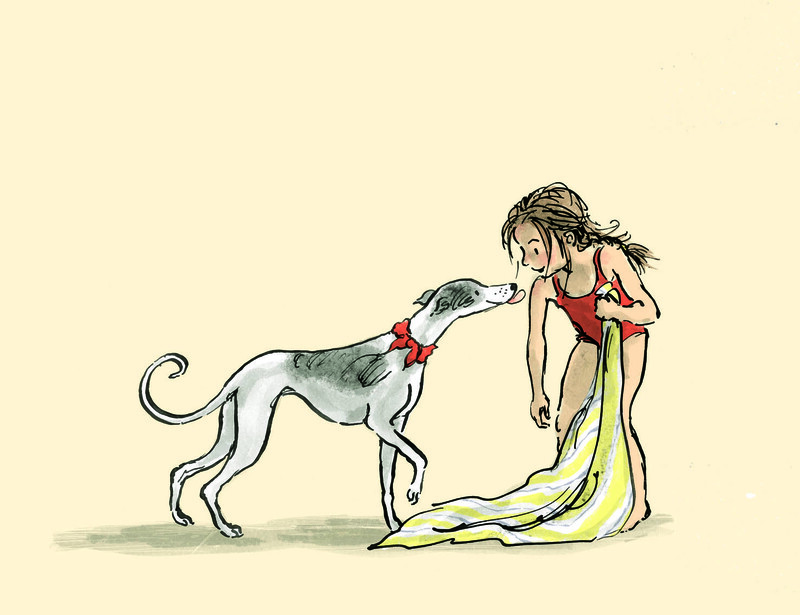 With Best Fishes – practising my book signing today and this is page four. Ahem. 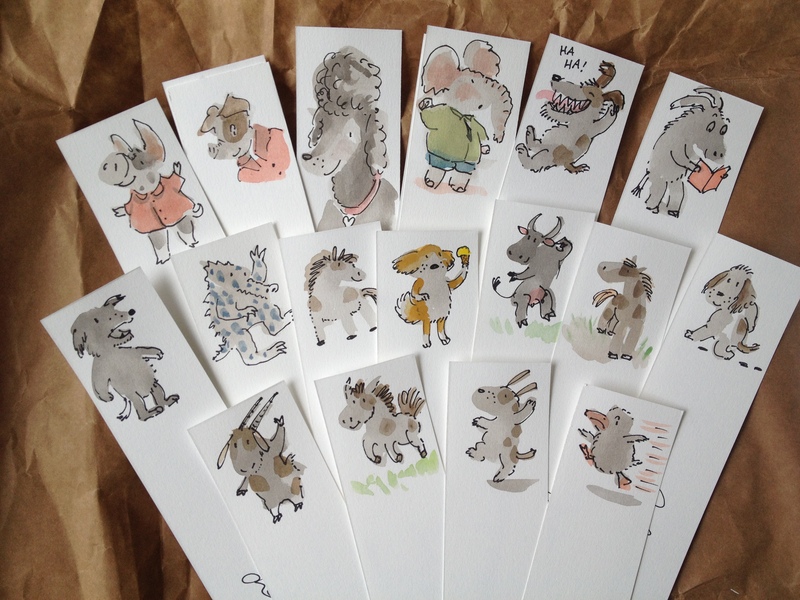 I have watched with awe, some illustrators who sign and doodle with ease. Anyway, see you at the next book signing! 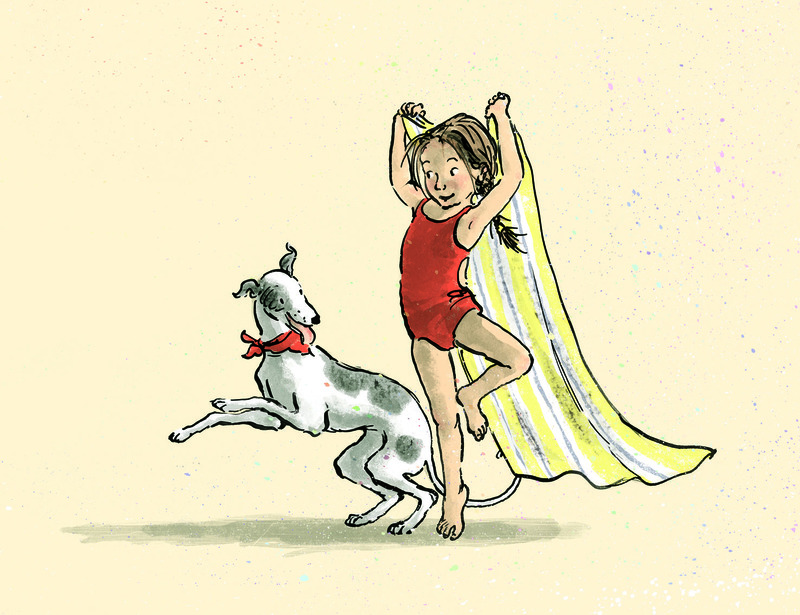 This entry was posted in books and reading, cats, creative process, Events, For Sale, illustration, Other people's work and tagged #thunderstormdancing, Ann Haddon, Ann James, art practice, Australian children's books, Australian illustrators, blobs, book illustration, book signing, bookmarks, books, cats, Federation Square, Federation Square Book Market, Judith Rossell, Melbourne, public appearance, signature, Terry Denton on June 3, 2015 by Judy Watson. I was led off the trail of birds this afternoon. I had an important task to complete that was overdue. 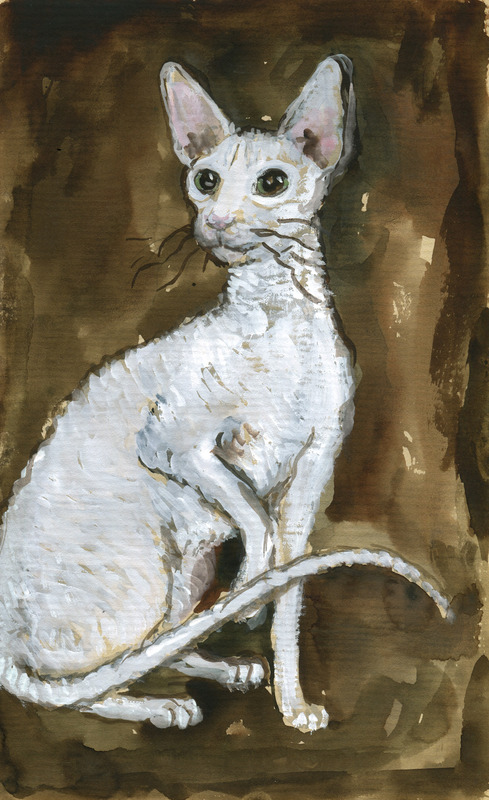 Lisa S contacted me many months ago to ask about my Cornish Rex artwork and she has been waiting patiently in New York for a signed copy of Thunderstorm Dancing for a long time. Boy is she tired! Because she has been waiting so long, she got some little bonuses in her bundle. Some Cornish doodles. 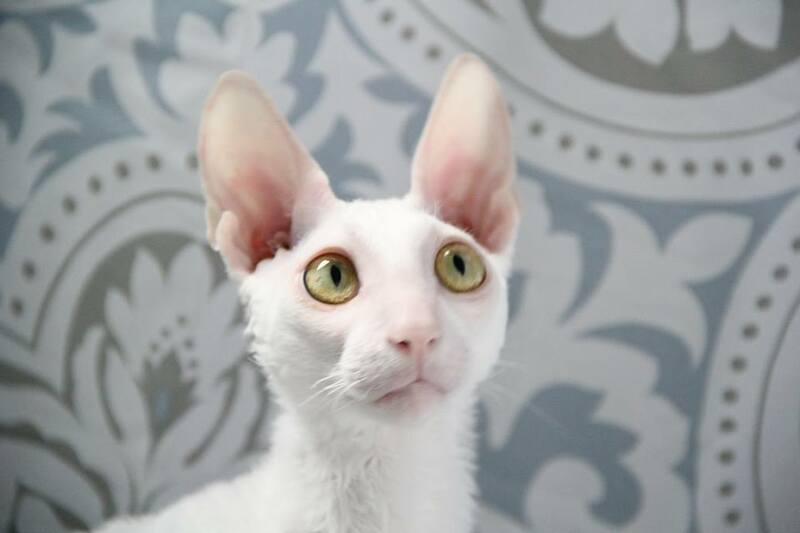 Lisa has two Cornish Rex cats. One is black (Nigel). One is white (Finley). Check out Finley with my Cornish Soliloquy drawing from last year. Today, I have finally wrapped up a signed copy of Thunderstorm Dancing for Lisa and it will go into the post tomorrow, bedecked with cats. 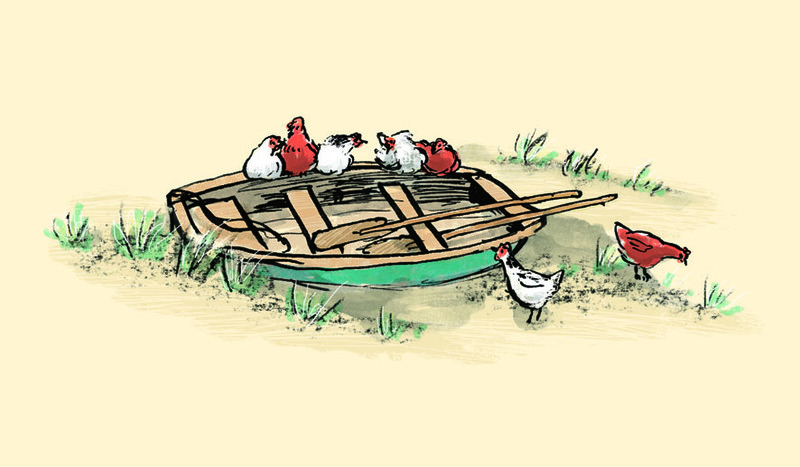 A little white Cornish sketch painted on the endpapers of ‘The Book of British Villages’. I was going to paint him on a map of Cornwall, but I got engrossed in this one instead. When I was at the post office a few days ago, the only stamps they had were husky dogs… That’s not going to go down well! 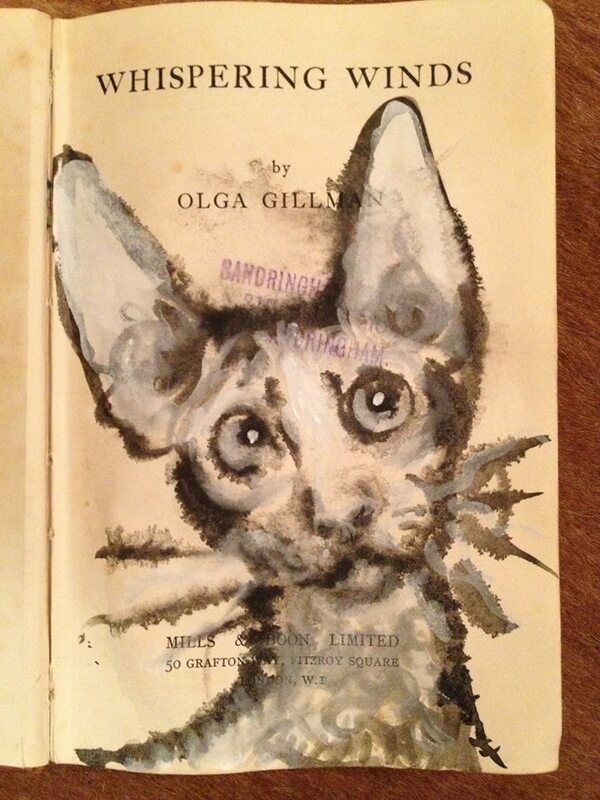 Fingers crossed there are some stamps there tomorrow that are more feline friendly. 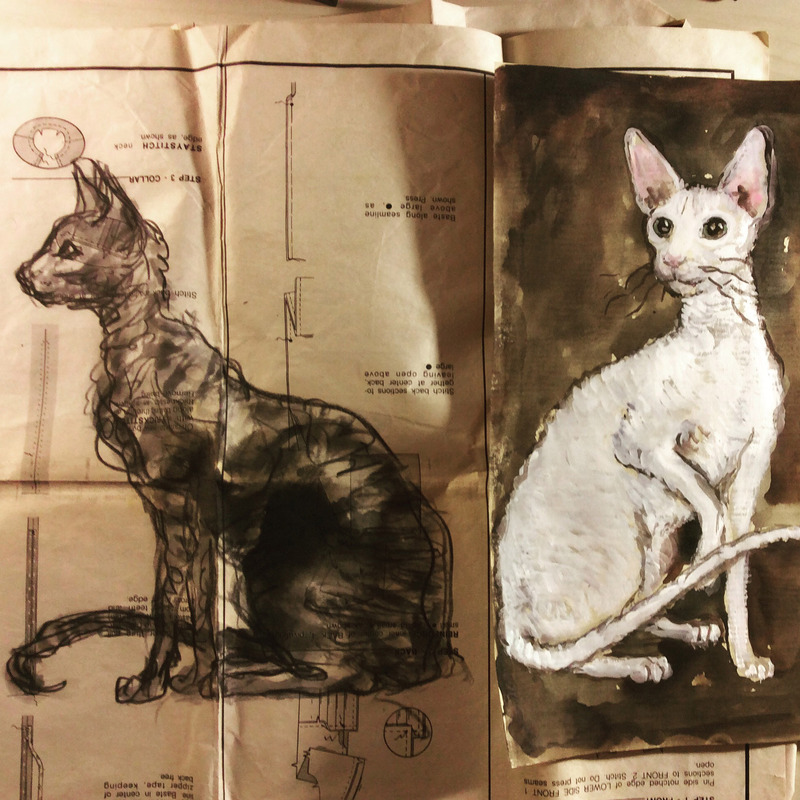 This entry was posted in altered books, books and reading, cats, For Sale and tagged #thunderstormdancing, altered book art, altered books, animals, book illustration, cats, Cornish Rex cats on May 26, 2015 by Judy Watson. 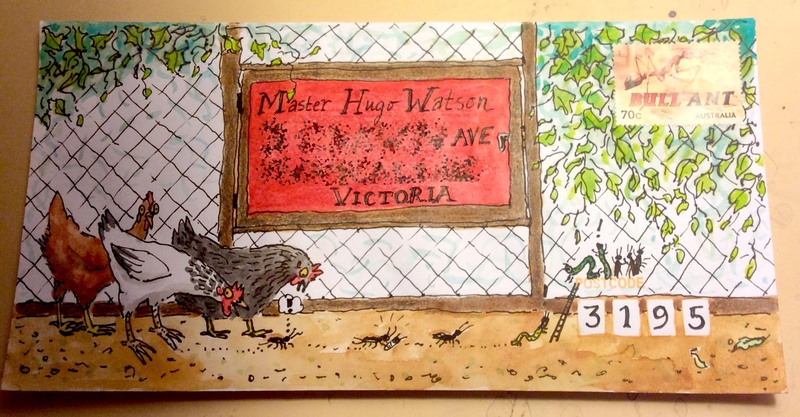 Hugo’s letter, just because he loved this envelope so much. What could I do? Or was it because she has a secret agenda? Perhaps she buys them for all of her illustrator friends and is right now amassing a HUGE and VALUABLE (requires all caps) collection of illustrated envelopes addressed to her. Aha! That’s it! I wonder if it’s too late to copy her… Geri, you devil. • Home made envelopes would be really, really special and you could make them from thick watercolour paper and use whatever media your heart desires. 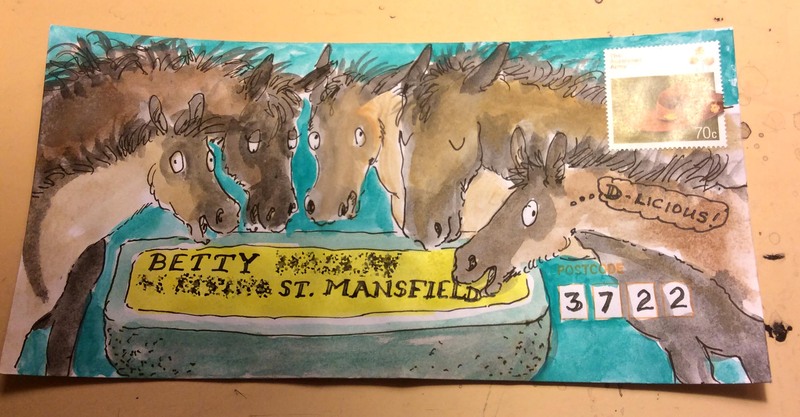 • Illustrated envelopes look okay when they are drawn (and coloured – optional) but look so much better, after the address goes on. Unfortunately I can’t publish them on-line with the lettering intact because that would be rude to recipients. But you can take my word for it. If you want to. • Choice of stamp can be crucial to success. If you live with a stamp collector, you’re set. If you don’t, you have to go to the post office and ask the people behind the counter to show you their REAL stamps which are hidden in a drawer. They will look a bit annoyed. Be prepared. • All this is just dandy until you realise that you can’t send an empty envelope. 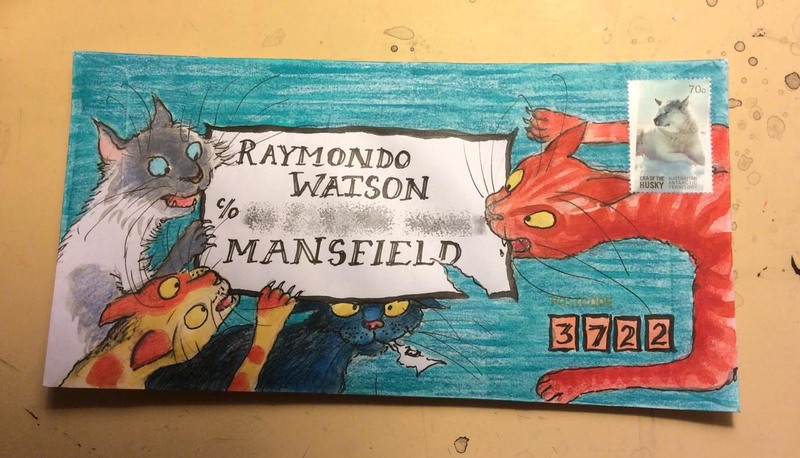 After all the time you spent laboriously illustrating an envelope for your friend, you now have to write a letter! Or send them a cheque if you have more money than time. But do this quickly, cheques will be extinct even before REAL stamps. Enjoy envelope decorating, and letter writing if you can find some time, because it is very satisfying, and ever so much fun to receive one. 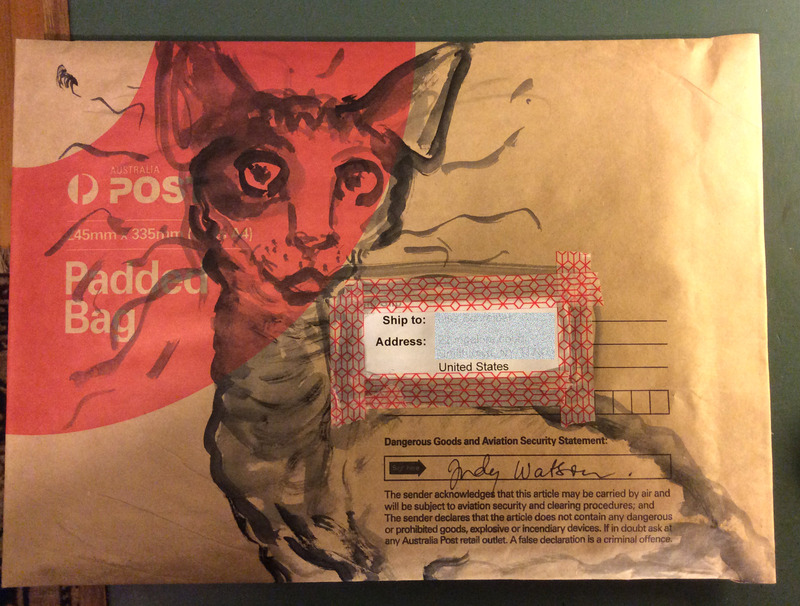 This entry was posted in art projects, cats, chickens, family, horses, illustration, Uncategorized, writing and tagged correspondence, illustrated envelopes, letters, stamps, writing on February 24, 2015 by Judy Watson. 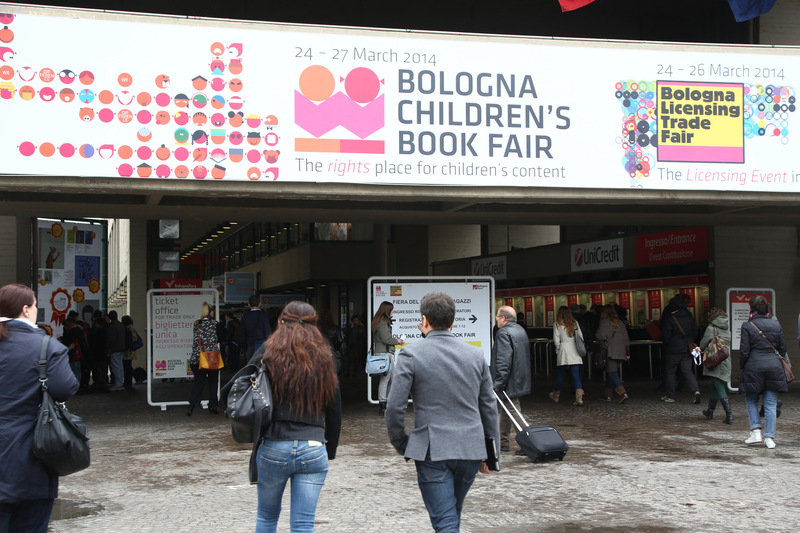 Bologna Children’s Book Fair, here I come! Oh boy! My air ticket is about to be booked for this! I can’t quite believe it. I’m letting myself be swept along and away. Thunderstorm Dancing will be going on a holiday to meet lots of people at the fair, and one of the spreads from the book will be featured in the Hello From Australia exhibition, organised by Books Illustrated. I’ll be helping set up the stand with Ann James and Ann Haddon and generally loitering about with my eyes out on stalks. 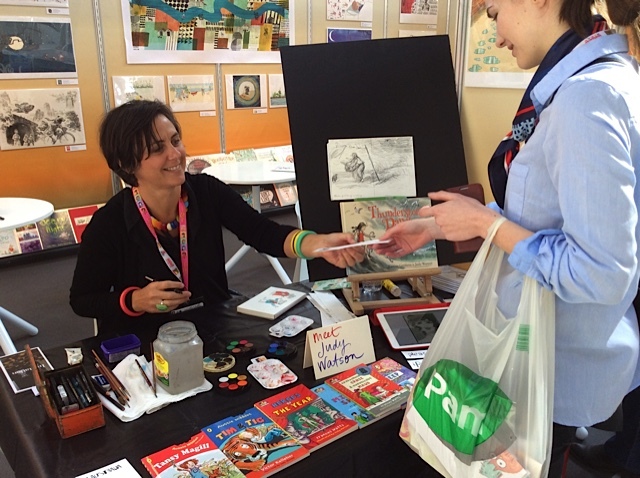 And I’ll have a stint or two doing drawing demonstrations, which should be fun. The only shame is that the fair is for book industry folk and is not open to the public so I won’t have any children coming to visit. 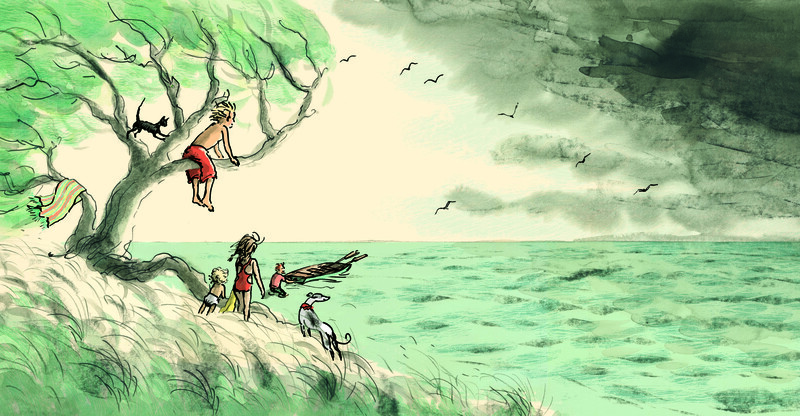 I love the conversations that happen with children when I am drawing for them. And many, many more. So I am looking forward to some great conversations and much inspiration. I’ll also get time to pop down and visit my friend David Capon in Puglia, Southern Italy, here. Wow! How beautiful is Casa della Scrittrice? This is Puglia. 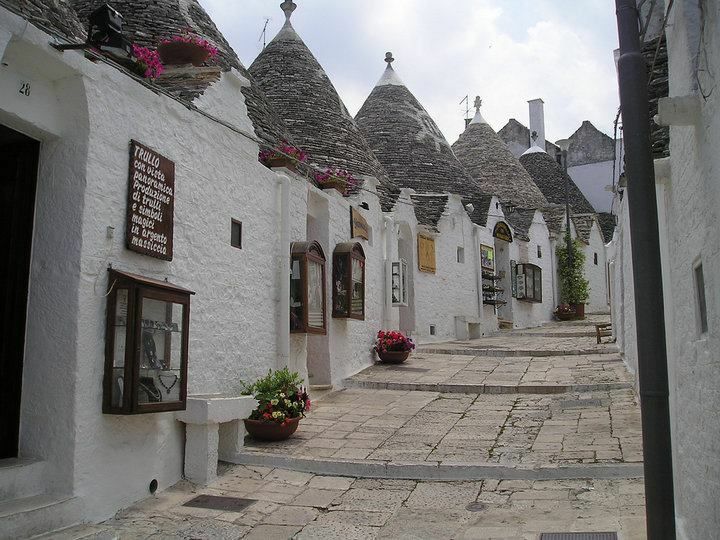 Those trulli remind me of a scene I absolutely loved in The Horse and his Boy by C S Lewis. Does anyone remember the scene where Shasta is outside the walls of the city of Tashbaan, alone amongst the tombs and the sun goes down? A cat comes and keeps him company. (The cat is Aslan in disguise of course.) 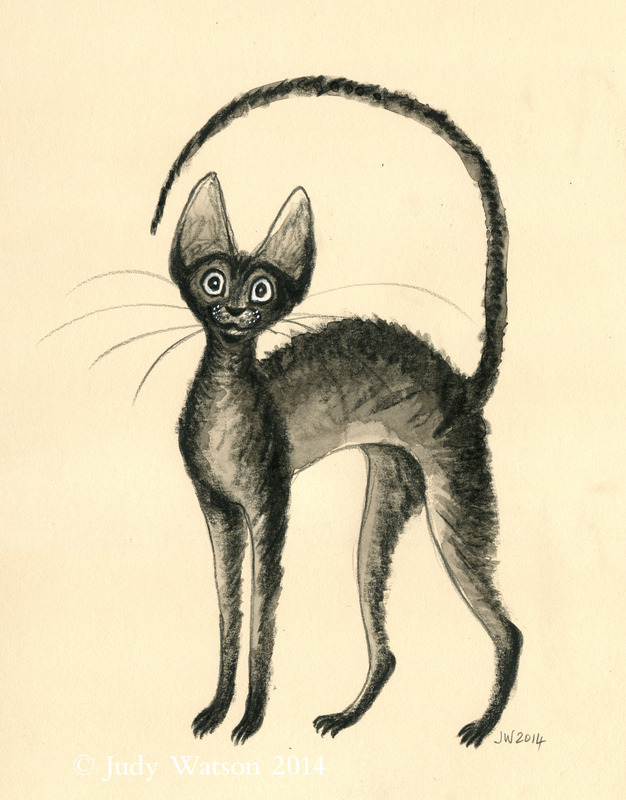 I just LOVE a magical cat. 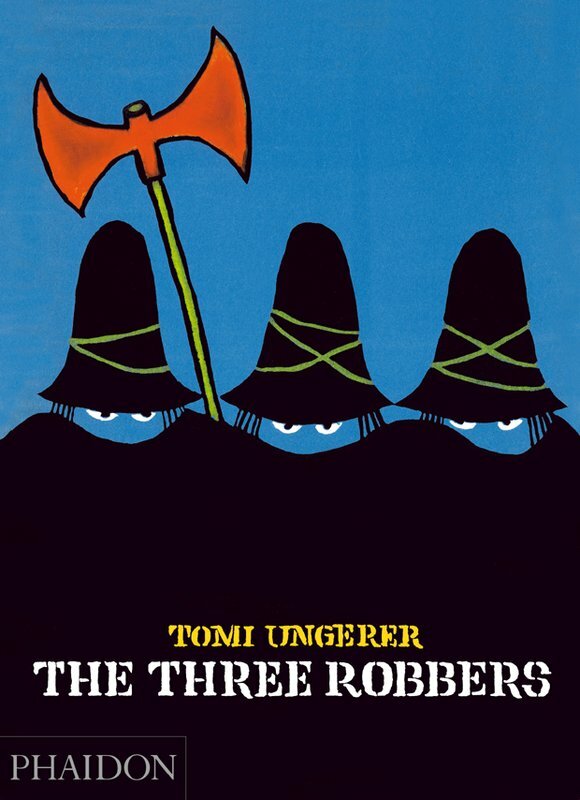 Actually they also remind me of another favourite book, Tomi Ungerer’s The Three Robbers. 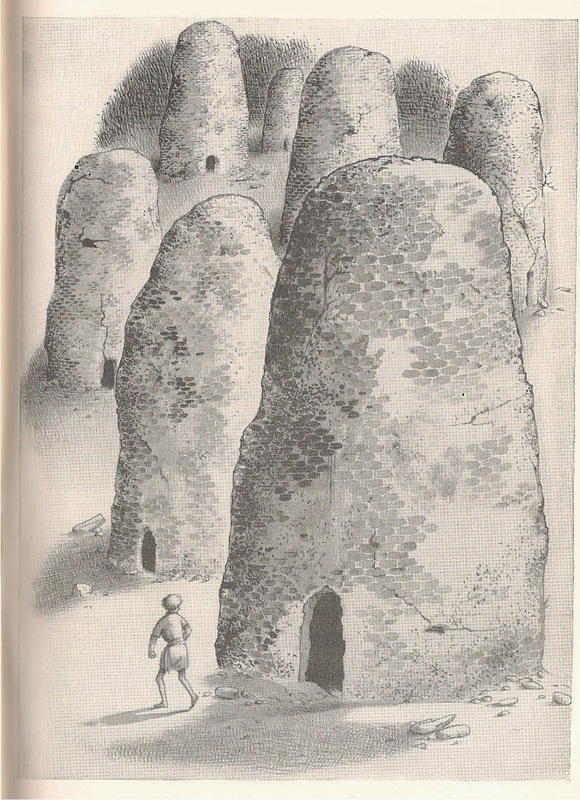 At the end of the book, the three robbers build an orphanage with domes the same shape as their hats. It’s a busy time. More soon. 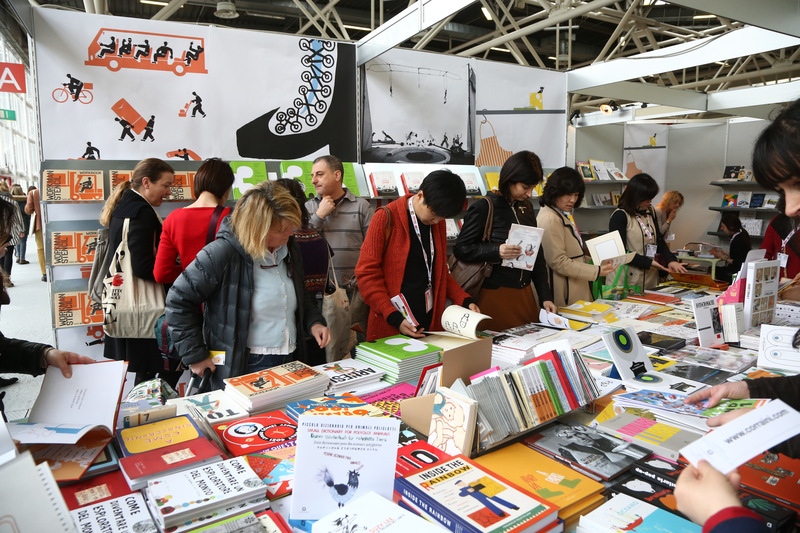 This entry was posted in books and reading, cats, Events, Other people's work, Uncategorized and tagged Bologna, Bologna Children's Book Fair, C.S. Lewis, Italy, Narnia, Puglia, The Three Robbers, Tomi Ungerer, travel on February 4, 2015 by Judy Watson. The Scribble Cornish of yesterday, became a fully drawn and painted Cartoon Cornish after dinner last night. 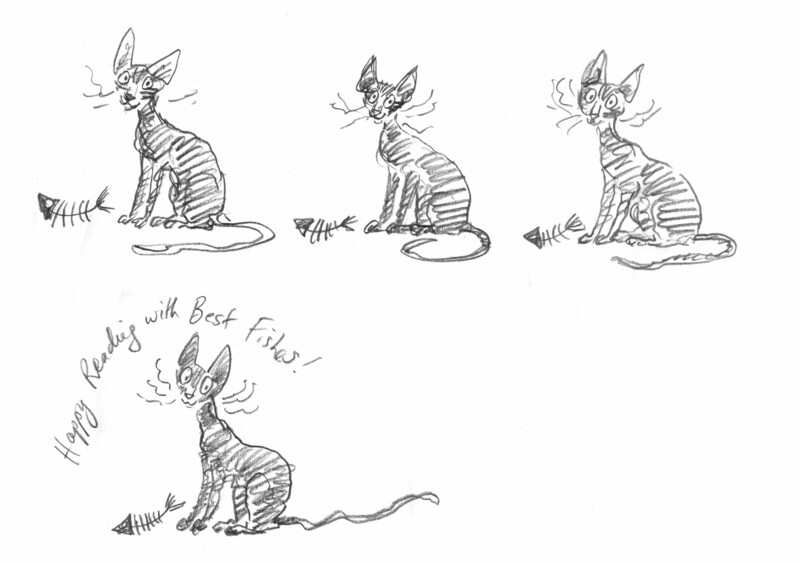 I started out to do an inky depiction, with wet edges, to suggest the fuzz, as per all of my work this year really. Fast and loose… But strangely I found myself taking the unprecedented step of using a sharpened Prismacolour pencil to draw in some detail, as the Prismacolour Artstick was frustrating me by going off rather too wildly on its own tangents. Anyway, Mr Cornish salutes you. 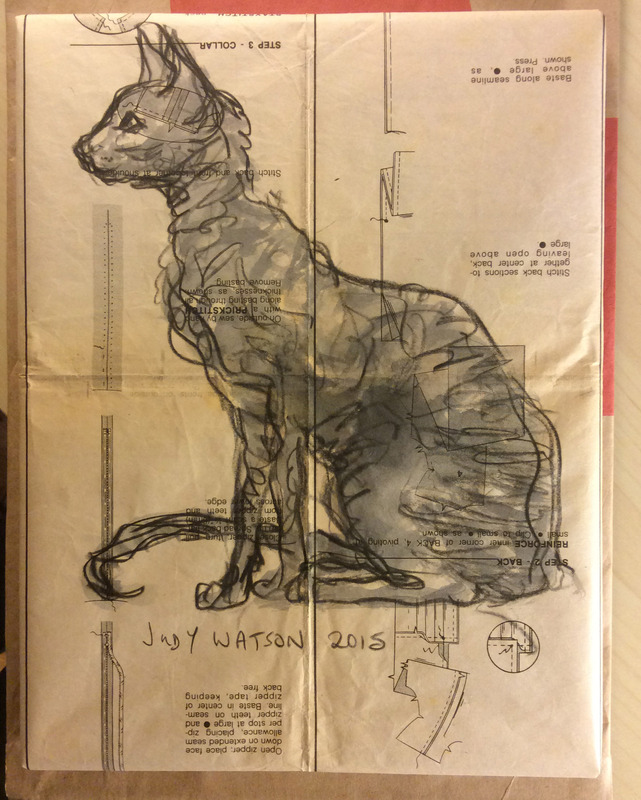 This entry was posted in cats, creative process, Uncategorized and tagged artstick, cat, Cornish Rex cats, drawing, litho paper, pencil, Prismacolour on November 6, 2014 by Judy Watson.